Writers love oysters. Or at least that’s how it seems to me. Ernest Hemingway, Tennessee Williams, M.F.K. Fisher, among others, pay homage in their pages to this common bivalve. They’re not the only ones. Oysters have become quite trendy. You can’t open a gourmet or lifestyle magazine today without someone contemplating the unami of the oyster. Oysters have become the new small batch whiskey. There’s even a new book out about the history of New York – from the oyster’s perspective. Seriously. It’s called The Big Oyster. What do they all know that I don’t? While I certainly appreciate an oyster shell chandelier or an antique oyster plate, I’ve never acquired a taste for oysters on the half shell. Given the choice, I order them fried or “Rockefeller” style. It’s not like I haven’t tried to cultivate a taste for these mollusks. I’ve eaten them freshly shucked on back porches and I’ve slurped them down in some of this country’s most renowned oyster houses. Once in Paris, a selection of France’s finest were presented to me on ice and displayed like jewels on a silver tiered stand. Though dazzling to look at, they tasted like coins. Unlike some people, I don’t have a particular aversion to the texture. Goodness knows plenty of slippery things have glided down my gullet over the years. Okra and eggplant, to name two. Over the years, I kept waiting to experience the so-called “oyster conversion moment” where something clicks and you develop an insatiable appetite for the slimy bastards. So far, it hasn’t happened. As I prepared my first book for publication, however, I decided the time was right to reconsider my relationship with the oyster. How could I call myself a serious writer if I couldn’t wax ad nausium about oysters au natural? I headed immediately to happy hour — oyster happy hour that is. Between 3-5pm at the Henlopen City Oyster House on Wilmington Avenue you can sample different oysters for less than one dollar each. My tasting partner and I bellied up to the bar and began ordering from the cute shucker. Our first oysters hailed from the south side of Prince Edward Island. Moderately salty with a clean finish, they were okay, but hardly memorable. Stepping things up, we went next for the “Naked Cowboy” oysters, advertised as beautifully briny with a strong mineral content, and hand harvested by divers from Long Island Sound. These were a little better, wilder for sure, and sort of like taking a mouthful of cold seawater. What I liked more was the story behind the name. Seems oyster diver Chris Quartuccio was looking for a name to distinguish these particular oysters. While driving down Seventh Avenue in Manhattan one day he stopped at a light in front of the muscular, mostly naked, former stripper turned street performer and now one of New York’s hottest tourist attractions known simply as “The Naked Cowboy.” It was Quartuccio’s Eureka moment. Harvesting oysters from icy water takes determination, boldness, and passion, and a “do what I gotta do attitude.” The name “Naked Cowboy,” he felt, embodied his work and his oysters. People seem to agree because his oysters are among New York’s most popular. The real “Naked Cowboy” gets a monthly commission. 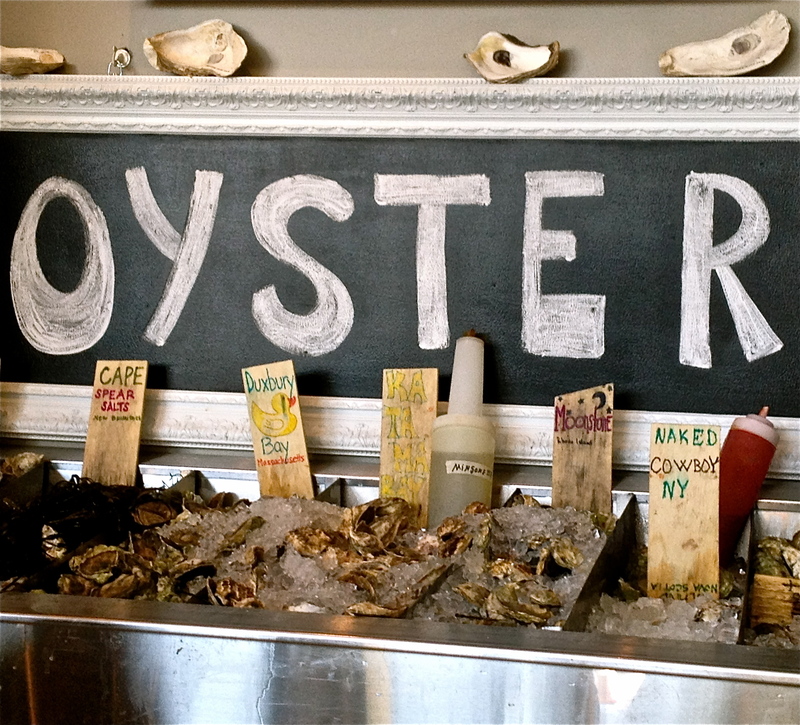 All the oysters “on tap” at the Oyster House were what are known as Eastern oysters (crassostrea virginica), one of the five major species of oysters cultivated in North America. They range from Canada to Florida and vary in taste from briny to muddy depending on where they grow. A general rule of thumb is that the further south you go the more tasteless the oyster becomes. The third and final mollusk we sampled came from Katama Bay, a shallow, sandy body of water on Martha’s Vineyard. Big and salty with a sweet finish, these oysters aren’t always available off island during the busy summer, so we were fortunate, according to our cute shucker, to get some. Of all the oysters we tried, this was my favorite. The taste was right, the texture too. I’d like to say this was the point where my senses became sharper – smell, sight, and taste – and that like Hemingway after drinking the cold liquid from each shell I began to be happy and inspired to write. Instead I’m left thinking about another quote by another writer: It was a brave man who swallowed the first oyster.